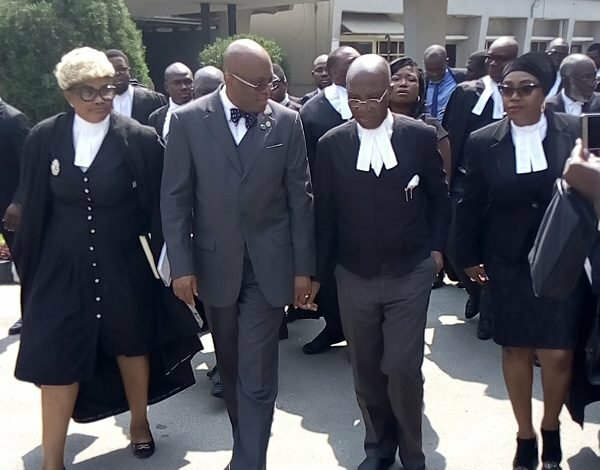 The President of the Nigerian Bar Association (NBA), Mr Paul Usoro (SAN), has been docked before the Federal High Court, Lagos, over an alleged N1.4billion fraud. Usoro was docked before Justice Muslim Hassan on a 10-count charge by the Economic and Financial Crimes Commission ( EFCC ). He pleaded not guilty. Usoro’s lawyer, Chief Wole Olanipekun (SAN), had earlier expressed his opposition to his client’s arraignment over the criminal charge. He drew the judge’s attention to a letter written by the NBA president to the Chief Judge of the Federal High Court, Justice Abdul-Kafarati, seeking the transfer of the case from the court. “I owe a duty to advise the court that the defendant made available to his lawyers, a copy of a letter dated 17th December, 2018, addressed to the Chief Judge of the Federal High Court praying for the transfer of the case to any judicial division between Uyo and Abuja or if in Lagos, to any other judge apart from my lord presiding. “We understand that a copy of the letter has been served on the court and since the letter is before the Chief Judge, the proper thing is to await his decision as a mark of respect for him,” he said. Responding, EFCC’s lawyer, Rotimi Oyedepo, urged the court to discoutenance Olanipekun’s submission. He said the ruling of the court fixing Tuesday for the arraignment of the defendant had not been set aside. He was of the view that the defence could only raise any objection after the plea of the defendant had been taken. “It was not the contention of the defence that the ingredient of the alleged offence did not take place in Lagos. The events that will lead to the transfer of the case to either Uyo or Abuja divisions are not available,” he said. In a ruling on the matter, the judge held that arraigning the defendant would not preclude the Chief Judge from taking decision on the letter. He, thereafter, ordered that the charge be read to the defendant. Afterwards, Usoro’s lawyer, Chief Olanipekun (SAN) moved his bail application. He urged the court to admit his client to bail on self-recognition. In the absence of any opposition from the EFCC, the judge admitted Usoro to bail in the sum of N250 million with one surety who must not be below the rank of a director in the public service in like sum. Justice Hassan also ordered the NBA president to deposit his international passport with the court. Further hearing on the matter has been adjourned to February 5, 2019.